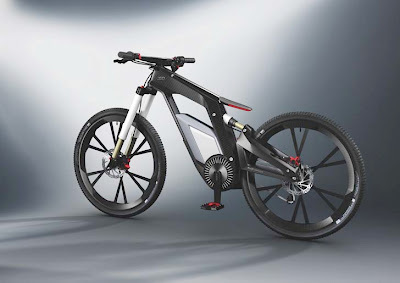 One of the highlights on the Audi stand is the bicycle technology concept known as the Audi e-bike Wörthersee – a sport bike that does not fit into any of the usual categories. It is neither a pedelec nor a conventional bike, but is best described as a high-end pedelec made by Audi for sport, fun and tricks. 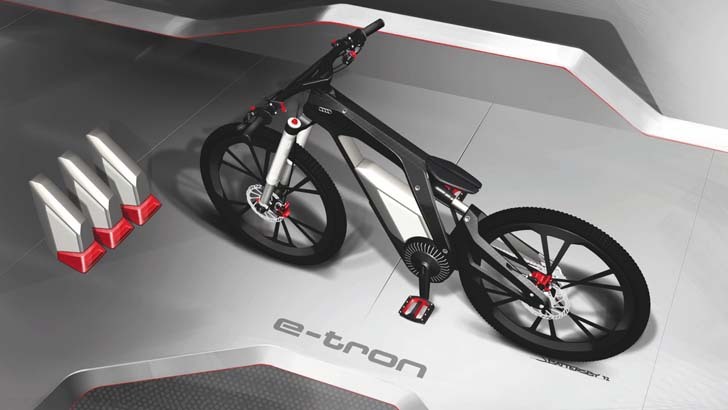 The Audi e-bike Wörthersee combines the Audi brand's principal competences – design, ultra, connect and e-tron – and explores the limits of what is technically feasible in terms of design, lightweight construction, networking and electric mobility. This show bike is futuristic at the very first glance – a bike for tomorrow and beyond. All its components, even the pedals, have been shaped by Audi's designers, for instance the 26-inch wheels made from CFRP that weigh only 600 grams (1.32 lb) each and have innovative large-area blade-pattern spokes. 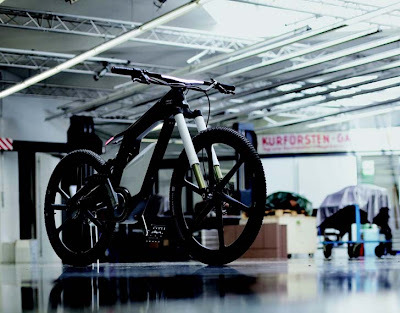 The Audi e-bike Wörthersee's ultra-light carbon-fiber frame weighs only 1,600 grams (3.53 lb). It makes use of bionic principles derived from nature. Material reinforcements are needed only at the points where loads actually occur. The swinging arm for the rear wheel is also made of CFRP. 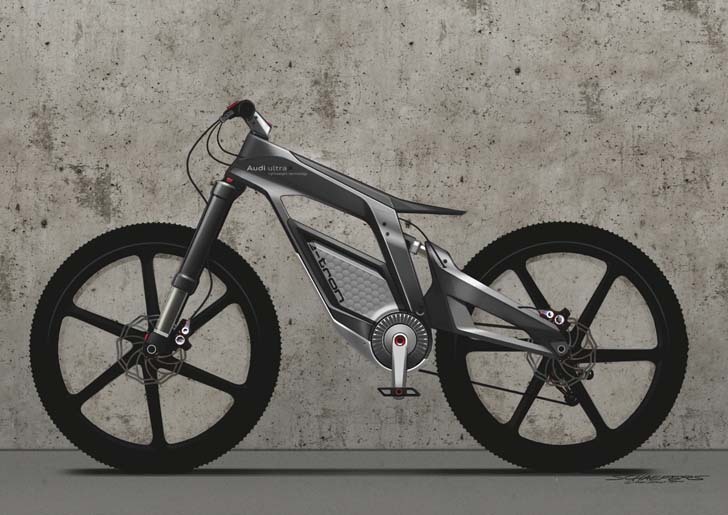 All in all, the Audi e-bike Wörthersee represents the full extent of the brand's expertise in ultra-lightweight design. In the 'Pure' mode the rider only propels the bike by means of the pedals. In the 'Pedelec' mode the rider is assisted by the electric motor; a top speed of up to 80 km/h (50 mph) can be reached and the action radius is between 50 and 70 kilometers (31 and 44 miles). 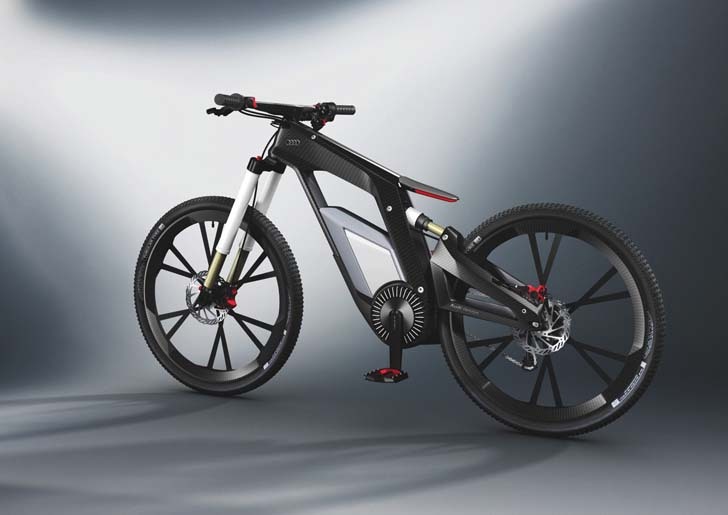 In the 'eGrip' program the Audi e-bike Wörthersee can be ridden with the electric motor providing all the necessary power; in this case at speeds up to 50 km/h (31 mph). The rider controls the power output from the electric motor at a twistgrip and can configure it at the on-board computer. In 'Wheelie' mode the power flow is electronically controlled in order to assist the rider when the front wheel is in the air. Alternative operating modes are available, and can be selected by smartphone or directly at the e-bike: either 'Power Wheelie' with an adjustable wheelie angle for less skilled riders, or 'Balanced Wheelie' for those with more experience. In the latter mode the rider's balance is maintained electronically: as his or her weight is displaced forward or back, this is counteracted by either braking or accelerating the electric motor. In this way the rider can influence the speed when riding on the rear wheel only by shifting his or her weight. Leaning forward speeds up the bike, leaning back slows it down. If the rider wants to use the pedals and maintain a constant power input, the training mode can be chosen. The electric motor then makes good the extra power needed when riding into the wind or up a hill, so that the rider's performance can be kept constant for training purposes. The Audi e-bike Wörthersee has a varied specification. The nine-speed hydraulically actuated gear shift has a very rapid sequential action, similar to the R tronic transmission in an Audi R8. The two disk brakes are also applied hydraulically. Seat height can be continuously adjusted at a handlebar control, even while the bike is being ridden. The front fork uses the more complex 'upside-down' principle; it is air-sprung, with 130 mm (5.12 in) of travel. LEDs are used for powerful lighting: the front light is integrated into the handlebar, the rear light into the seat. The rider's smartphone communicates by WLAN with the bike's computer. The antenna is integrated into the front brake line. To ride the bike, the immobilizer is deactivated at the smartphone; the bike is then ready for use. In addition, by way of the interface between the bike's computer and the smartphone, video images recorded while riding or even complete trick sequences can be transmitted to the Internet or the trainer. Every trick performed successfully qualifies for success points. As the number of points increases, the rider is rewarded and at the same time the challenge level rises. The total Internet ranking can be compared with friends or other riders. The rider can locate them by way of Facebook entries that can be shown on the Audi e-bike Wörthersee's display.